that you would normally need a Front end Loader or Fork Lift Mast for. Twin Deck Mower is P.T.O. driven and fully adjustable. Designed for mowing the grass grown between plastic mulch beds. Punch evenly spaced holes in a fraction of the time normally taken. Suitable for Reflective Mulch, Green house covers etc. Width fully adjustable from 1metre to 7.5 metres. Unidirectional with sensitive drag control. 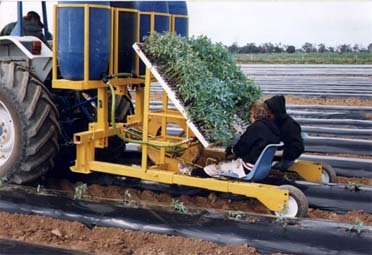 The Tatura Engineering Water Wheel Planter is shown here planting tomatoes. The rotating wheel pierces the plastic and injects a measured quantity of water. The plants are positioned by the two operators. The Water Wheel Planter can be adapted to a range of different species.